I first visited Alaska in 2004 as part of a work trip. It was the dead of winter, it was cloudy and snowy for the entire, short 3-day trip, but one afternoon we did manage a short trip south of Anchorage along the Kenai Peninsula. Just from that short glimpse, I knew I had to return soon. I've been back to Alaska several times since, mostly for work, but we also had a really wonderful family vacation there. One of my most memorable birding experiences ever occurred on one of those trips. I was hanging out at "Potter's Marsh", a wetland area near the coast with fresh water and a lot of nesting Mew Gulls and Arctic Terns. I was enjoying shooting the frenzy of activity as parents caught small fish and brought them back to the nests for the little downy fluff balls that had already hatched. 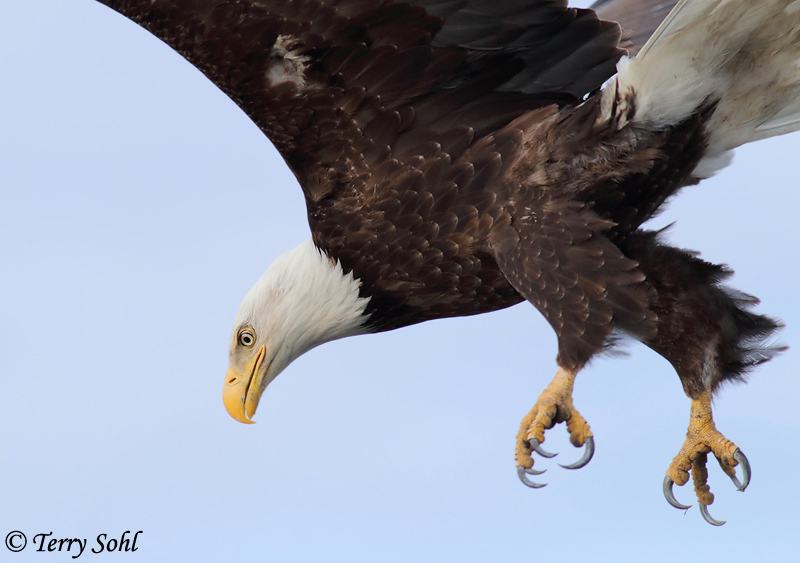 As I was shooting, I noticed a Bald Eagle slowly flying in over the marsh. He slowly circled around, definitely interested in the activity below, but I didn't give him much thought as I was concentrating on shooting a nearby Mew Gull nest. As my attention returned to the nest, it wasn't long before I heard a commotion amongst all the nesting birds, with a lot of alarm calls and other vocalizations. I looked up, and the eagle was diving towards the marsh...and RIGHT for my location!!! Much to my surprise, he was honed in on the Mew Gull nest RIGHT in front of me, and came screaming down at such close range that I had little time to get the camera up and try to capture the action. The eagle landed about 2 feet from the nest and did...nothing. The lone parent on the nest bailed as the eagle descended, but once the eagle landed, it seemed disinterested in the nest. Perhaps it was looking for young, and in this particular nest, none had hatched yet. Or perhaps it wanted the adult but struck out when the gull flew away. It was then that the eagle seemed to notice that HEY...there's a guy right here with a camera! We just kind of stared at each other for a moment, with me too much in awe of the moment to even raise my camera again for photos. With a dismissive toss of the head, he took off and flew back over the marsh, again raising a ruckus. It wasn't until later when I got back to my hotel that I saw that I had managed to capture this photo as the eagle descended towards the nest, eyes locked on the target, and those powerful talons ready to go to work. The eagle was SO close...far too close to even get the entire bird in the frame, which isn't a problem I typically have with wild eagles! But this shot will always be one of my favorites, despite the unusual composition. From May of 2014.